Remember chalk? Teachers hated it because it got all over their hands and clothes, and extended inhalation could trigger asthma. But schools may have a bigger problem in the works: Now ubiquitous in classrooms, many dry erase markers contain a chemical linked to serious health problems. What’s the solution? Learn how to identify this dangerous chemical, and make safer choices for the white board. 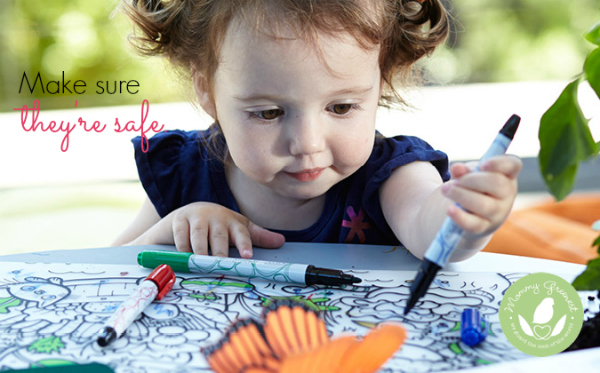 Dry erase markers contain a chemical linked to serious health problems. Learn how to identify it and make safer choices for the white board. Many dry erase markers contain a toxic soup of ingredients, but the chemical you want to watch out for most is methyl isobutyl ketone, also known as 2-Butanone. The Environmental Protection Agency cautions that exposure can lead to irritation of the eyes, nose and throat, and is associated with neurological, liver, kidney and respiratory problems. And information from Princeton University warns of central nervous system depression, characterized by headaches, dizziness and nausea, among other problems, which in advanced stages can cause death from respiratory failure. Obviously, I don’t think teachers aren’t going to die from using dry erase markers. But after learning that the maximum recommended safe exposure to 2-Butanone is less than 15 minutes during an eight-hour day, I am concerned. Teachers using these markers are experiencing much higher-than-recommended exposures—as are students who are using or sitting close to the white board. What’s a chalk-hating mama to do? Gift your teachers with markers that are free of toxic chemicals like 2-Butanone. I found these Modern-Twist Markers on Amazon, and confirmed their non-toxic status. Not only are they free of toxic chemicals, but at $9 for six, they’re a pretty good buy, too! I thank you for this post! It has helped me understand why I’ve been experiencing increased mental confusion (often times can be severe) during my teaching career. Many classrooms use these markers as a means for practice during lessons. Meaning EVERY student has a board and a marker. Recently, I purchased an air quality tester and placed it in my classroom. In the morning, it read “FRESH”; but by the afternoon, that reading increased so much that it changed to “UNQUALIFIED”. As soon as I saw this, I opened up my classroom windows, and within 20 mins, the air was reading “FRESH” again. I know now this is directly due to the use of white board markers (whole class). Your blog has also explained A LOT! So, thank you! I will make some changes immediately! are the expo brand non-toxic actually non-toxic… and should children be using their hands to wipe of the boards…..have seen it in my classroom many times and want to be armed with facts before I go off on a rant about it to them….thanks. Do these markers still contain xylene? I make kids toys, animals and cars,trucks,planes…. And I dislike spray paints and clear coats from the aerosol cans, and my best sellers are the animals and cars made then colored with markers because they look old after. But I don’t like the idea of sharpies or markers that I don’t know are safe for kids. And it seems pointless to use the beeswax combo over possibly toxic markers for the finish. Yet another thing that will kill you! I’m a teacher. Thanks for looking out for us and the kids. My daughter has a whiteboard on one side of her easel. She discovered the other day that a regular washable marker is *great* for drawing on it, especially when the marker doesn’t belong to her. Luckily, I found out that the washable marker (surprise) washes off quite easily with a damp cloth. I’m not sure if the ink in your standard Crayola marker is all that good for you, or how long one would last if used on a white board, but here’s another idea for folks who don’t want to go out and buy a specialized product/one that kids perhaps shouldn’t use on paper (?). I didn’t know about non-toxic whiteboard markers, though–thanks for sharing that! Good tip, Emily! I have noticed that there is a sort of phantom stain when my daughter uses regular markers. But I have gotten it out with vinegar, so there’s that 🙂 Thanks for sharing!